Typical Chiquito's standalone unit development, Kingston-upon-Hull with the previous logo. 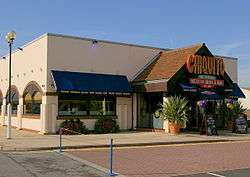 Chiquito is a UK-based restaurant chain specialising in Tex-Mex foods. The company was established in 1989 and has 68 restaurants across the country. It dubs itself as 'The Original Mexican Grill & Bar' and has been described as the United Kingdom's best-known Mexican chain. Chiquito restaurants are part of the Restaurant Group. Dishes such as nachos, chilli poppers, burritos, fajitas, burgers, sandwiches, salads and steaks from the grill are served in Chiquito. They also serve a wide range of cocktails, such as tequila and rum cocktails as well as a choice of wines. The restaurants, which tend to feature a large bar and lounge style restaurant have rustic interior décor, based on traditional Mexican architecture and culture, where old Mexican posters and photos adorn the walls, alongside piñatas plates, castanets, fans, and sombreros. Spanish and Mexican music plays throughout the restaurant. 1 2 3 4 Ritchie, Simon (27 December 2008). "Food & Drink - Chiquito, Clifton Moor, York". York Press. York. Retrieved 12 October 2011. ↑ "Strong Brands, Focussed Strategy" (PDF). Annual Report 2010. The Restaurant Group plc. p. 2. Retrieved 12 October 2011. ↑ "Mexican chain hits town". Belfast Telegraph. Belfast. 15 April 2010. Retrieved 12 October 2011. ↑ "Restaurant Group serves up strong sales". Reuters. 12 September 2007. Retrieved 12 October 2011. 1 2 Anson, John (19 January 2008). "Chiquito's, Blackburn". Lancashire Telegraph. Blackburn. Retrieved 12 October 2011. ↑ "Famous Cocktails". Company website. Chiquito. Retrieved 12 October 2011. 1 2 Lloyd, Jane (30 March 2007). "Eating Out". Liverpool Daily Post. Liverpool. Retrieved 12 October 2011. ↑ Smithers, Rebecca (18 November 2015). "More than half of UK's family restaurant chains serving unsustainable seafood" – via The Guardian. Wikimedia Commons has media related to Chiquito_(restaurant).